Providing employee benefits allows you to stand out as a preferred employer. Some companies recognize the importance of putting recruitment and personnel retention at the core of their strategies. In addition, it is considered a pledge of appreciation towards your personnel. Are you considering group savings to your employees or increasing your current coverage? 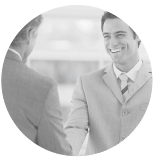 You should know that several options are available to companies and that our company’s financial advisors will guide you in your decision making. Whether or not you have an insurer, with or without a desire for change, we can take over your employee benefits and group savings plan. We have selected for you a range of trusted companies.